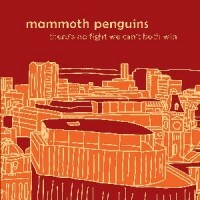 For the uninitiated, Mammoth Penguins are a 3-piece indie pop powerhouse, showcasing the songwriting and vocal talents of Emma Kupa (Standard Fare, The Hayman Kupa Band) backed up by the noisiest rhythm section in indie pop Their first album, Hide and Seek, was released with the much-loved and sorely missed Fortuna Pop! in 2015. Stand-out tracks ‘Strength In My Legs’ and ‘When I Was Your Age’ were picked up by BBC 6Music and Radio X, and the band played a live session for Marc Riley the following year. But Mammoth Penguins didn’t want to stop there. Their follow-up release John Doe in 2017 was an ambitious concept album, exploring the feelings of loss and anger at a man who fakes his own death, only to return years later. It featured contributions from Haiku Salut’s Sophie Barkerwood and Alto 45’s Joe Bear, and expanded well beyond the 3-piece rock‘n’roll template, with washes of strings, synths and samples (field recordings of butter being scraped on toast, photocopiers, and Ramsgate beach helping to fully immerse the listener in the world the band have created) filling out and developing Kupa’s songwriting. Having had their ‘and now for something completely different’ moment, the band have brought that ambition and expanded palette to the production of this new release. The sound is big, bold and confident—with layers of guitars, backing vocals and keys all adding extra muscle—but maintaining Emma’s candid, heartfelt, confessional style of songwriting, and the jubilant power pop hooks that made the first record so special. This time around, classic themes of love, loss and conflict are (mostly) given a hopeful and optimistic spin that opposition is neither inevitable nor hopeless. For musical comparisons, think Land of Talk, and Philadelphia bands such as Swearin and Hop Along, but Kupa’s insight into the everyday and her ability to pen such relatable and honest missives means that, often, the best comparison for Mammoth Penguins’ music is with your own past. “Like a lot of songwriters, my songs are derived from my own personal experiences, thoughts and feelings, long lived or fleeting.